Hunters who are in for a much bigger challenge go for Deer-hunting. 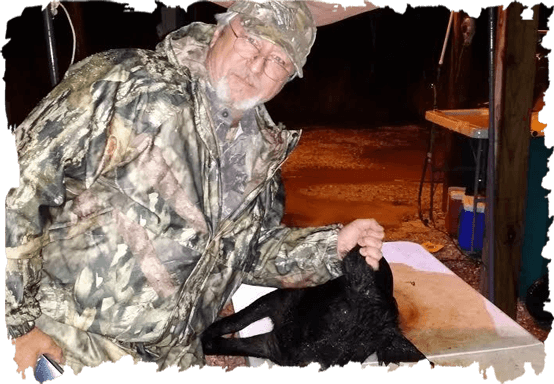 The skills and the guts required to take on hunting Deer in Florida is far greater than hog-hunting. Considering the ability of the Deer to outrun even the fastest predator on the planet, a Deer can most likely gain speed in a few seconds and escape at the slightest sound. Being able to successfully take down a Deer with a single shot is the goal of every Deer-hunter. But what does it really take to guarantee a lethal shot? Using night vision with infrared optics can make the job much easier but where is the challenge in that? The real victory comes not with the advantage of technology but the ability to shoot sharply with sheer instinct, common knowledge and patience. Outdoor Adventures offers all this as the most successful hunting operation in Florida. They have mastered the demands of every successful Deer-hunting situation. Any hunter who knows the Deer’s ability for speed knows there’s one way to beat this docile but slippery beast; the vital organs. You may not be able to outrun the Deer but there are several vital parts for which you should aim perfectly to guarantee a drop-where-it-stands shot while hunting Deer in Florida. Tear duct to tear duct – this shot is clearly what it implies; a shot between the eyes. It’s not really the first and best option considering how difficult this shot can be, but anatomically this targets the deers brain and instantly kills it in seconds. However, this aim requires accuracy since a half inch too high can hit above the head and a half inch too low can hit the nose. For a side shot, it’s usually aimed at the 4th cervical vertebrae of the spine at the back of the skull. Double Shoulder shot – this shot hits the spine and leaves the Deer paralyzed. Taken at very long distances, 200-300 yards, this is a first option among Deer hunters. This shot is also called the boiler-room since it clearly targets the heart and lungs but, even missing those two organs, can still hit other vital organs to leaves a blood trail. This is an easy shot for hunters since it allows a view of the deers broad side; providing a wider target. Neck – a shot to this area damages the spinal cord and vertebrae, also a critical organ that leaves the Deer lifeless with just one single shot. Simply approach the inert Deer to quickly and humanely deliver your final kill shot. 82% of Deer hunters consider the double shoulder shot the most effective shot to aim. An understanding of the Deer’s anatomy is the key to successfully hunting Deer in Florida. Outdoor Adventures also offers other services after taking down that most-prized of prey. Add-on services include skinning, cutting and packing of Deer meat for an affordable fee. Call us now 239-243-9663 and we will take care of everything for you.